The opinions of others have a profound influence on decision making in adults. The impact of social influence appears to change during childhood, but the underlying mechanisms and their development remain unclear. We tested 125 neurotypical children between the ages of 6 and 14 years on a perceptual decision task about 3D-motion figures under informational social influence. In these children, a systematic bias in favor of the response of another person emerged at around 12 years of age, regardless of whether the other person was an age-matched peer or an adult. Drift diffusion modeling indicated that this social influence effect in neurotypical children was due to changes in the integration of sensory information, rather than solely a change in decision behavior. When we tested a smaller cohort of 30 age- and IQ-matched autistic children on the same task, we found some early decision bias to social influence, but no evidence for the development of systematic integration of social influence into sensory processing for any age group. Our results suggest that by the early teens, typical neurodevelopment allows social influence to systematically bias perceptual processes in a visual task previously linked to the dorsal visual stream. That the same bias did not appear to emerge in autistic adolescents in this study may explain some of their difficulties in social interactions. Many people consume news via social media. It is therefore desirable to reduce social media users’ exposure to low-quality news content. One possible intervention is for social media ranking algorithms to show relatively less content from sources that users deem to be untrustworthy. But are laypeople’s judgments reliable indicators of quality, or are they corrupted by either partisan bias or lack of information? Perhaps surprisingly, we find that laypeople—on average—are quite good at distinguishing between lower- and higher-quality sources. These results indicate that incorporating the trust ratings of laypeople into social media ranking algorithms may prove an effective intervention against misinformation, fake news, and news content with heavy political bias. Reducing the spread of misinformation, especially on social media, is a major challenge. We investigate one potential approach: having social media platform algorithms preferentially display content from news sources that users rate as trustworthy. To do so, we ask whether crowdsourced trust ratings can effectively differentiate more versus less reliable sources. We ran two preregistered experiments (n = 1,010 from Mechanical Turk and n = 970 from Lucid) where individuals rated familiarity with, and trust in, 60 news sources from three categories: (i) mainstream media outlets, (ii) hyperpartisan websites, and (iii) websites that produce blatantly false content (“fake news”). Despite substantial partisan differences, we find that laypeople across the political spectrum rated mainstream sources as far more trustworthy than either hyperpartisan or fake news sources. Although this difference was larger for Democrats than Republicans—mostly due to distrust of mainstream sources by Republicans—every mainstream source (with one exception) was rated as more trustworthy than every hyperpartisan or fake news source across both studies when equally weighting ratings of Democrats and Republicans. Furthermore, politically balanced layperson ratings were strongly correlated (r = 0.90) with ratings provided by professional fact-checkers. We also found that, particularly among liberals, individuals higher in cognitive reflection were better able to discern between low- and high-quality sources. Finally, we found that excluding ratings from participants who were not familiar with a given news source dramatically reduced the effectiveness of the crowd. Our findings indicate that having algorithms up-rank content from trusted media outlets may be a promising approach for fighting the spread of misinformation on social media. A study that is the product of a collaboration across seven countries has identified brain signatures that can indicate consciousness without relying on self-report or the need to ask patients to engage in a particular task. It demonstrates that conscious and unconscious patients can be differentiated after brain injury. The brain activity patterns of injury patients that are unconscious are similar to those observed in normal subjects under deep anaesthesia. We found two main patterns of communication across regions. One simply reflected physical connections of the brain, such as communication only between pairs of regions that have a direct physical link between them. This was seen in patients with virtually no conscious experience. Differentiation between self-produced tactile stimuli and touch by others is necessary for social interactions and for a coherent concept of “self.” The mechanisms underlying this distinction are unknown. Here, we investigated the distinction between self- and other-produced light touch in healthy volunteers using three different approaches: fMRI, behavioral testing, and somatosensory-evoked potentials (SEPs) at spinal and cortical levels. Using fMRI, we found self–other differentiation in somatosensory and sociocognitive areas. Other-touch was related to activation in several areas, including somatosensory cortex, insula, superior temporal gyrus, supramarginal gyrus, striatum, amygdala, cerebellum, and prefrontal cortex. During self-touch, we instead found deactivation in insula, anterior cingulate cortex, superior temporal gyrus, amygdala, parahippocampal gyrus, and prefrontal areas. Deactivation extended into brain areas encoding low-level sensory representations, including thalamus and brainstem. These findings were replicated in a second cohort. During self-touch, the sensorimotor cortex was functionally connected to the insula, and the threshold for detection of an additional tactile stimulus was elevated. Differential encoding of self- vs. other-touch during fMRI correlated with the individual self-concept strength. In SEP, cortical amplitudes were reduced during self-touch, while latencies at cortical and spinal levels were faster for other-touch. We thus demonstrated a robust self–other distinction in brain areas related to somatosensory, social cognitive, and interoceptive processing. Signs of this distinction were evident at the spinal cord. Our results provide a framework for future studies in autism, schizophrenia, and emotionally unstable personality disorder, conditions where symptoms include social touch avoidance and poor self-vs.-other discrimination. I'm passing on this fascinating article that the violinist in my piano trio sent to her musician colleagues. Trainor's group at McMaster University documents how body sway reflects joint emotional expression in music ensemble performance. Granger causality is a statistical estimation of the degree to which one time series is predicted by the history of another time series, over and above prediction by its own history. The larger the value of Granger causality, the better the prediction, and the more information that is flowing from one time series to another. Previous studies have shown that Granger causalities among performers’ motions in a music ensemble reflect leadership dynamics and thus information flow31,36,43, which are higher-order aspects of joint action. Parents mention sons more often than daughters on social media. Parents’ preference for sons is a well-known phenomenon. This study examines whether the use of social media by parents is gender biased. Due to the large-scale use of social media, even a moderate bias might significantly contribute to gender inequality. We use data from a Russian social networking site on posts made by 635,665 users and find that parents mention sons more often than daughters and that posts featuring sons get more “likes.” This gender imbalance may send a message that girls are less important than boys or that they deserve less attention. Particularly in a country with an above-average ranking on gender parity, this invisible bias might present an intractable obstacle to gender equality. Gender inequality starts early in life. Parents tend to prefer boys over girls, which is manifested in reproductive behavior, marital life, and parents’ pastimes and investments in their children. While social media and sharing information about children (so-called “sharenting”) have become an integral part of parenthood, whether and how gender preference shapes the online behavior of users are not well known. In this paper we use public posts made by 635,665 users from Saint Petersburg on a popular Russian social networking site, to investigate public mentions of daughters and sons on social media. We find that both men and women mention sons more often than daughters in their posts. We also find that posts featuring sons receive more “likes” on average. Our results indicate that girls are underrepresented in parents’ digital narratives about their children, in a country with an above-average ranking on gender parity. This gender imbalance may send a message that girls are less important than boys or that they deserve less attention, thus reinforcing gender inequality from an early age. Correlations between our gut microbiota and mental health. Valles-Colomer et al. note variations in the levels of different groups of gut bacteria that correlate with depression, or with higher quality of life. Added note: Pennisi has done a commentary on this and similar work. I want to point to two articles on how we make rapid judgements based on first impressions. Competence is perceived as the most important characteristic of a good politician. But what people perceive as an important characteristic can change in different situations. Imagine that it is wartime, and you must cast your presidential vote today. 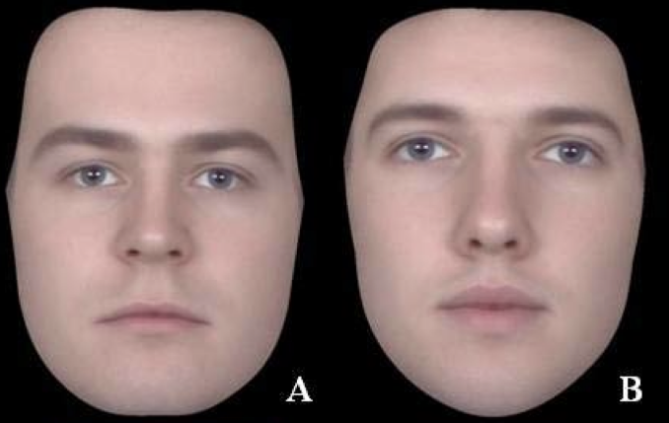 Would you vote for face A or face B in Figure 1 below? Most people quickly go with A. What if it is peacetime? Most people now go with B. These images were created by the psychologist Anthony Little at the University of Bath and his colleagues in the UK. Face A is perceived as more dominant, more masculine, and a stronger leader – attributes that matter in wartime. Face B is perceived as more intelligent, forgiving, and likeable – attributes that matter more in peacetime. 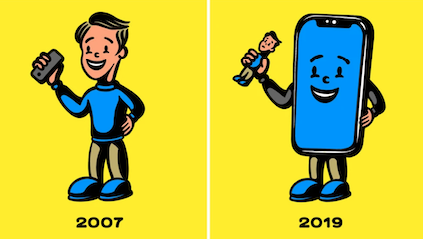 Now look at the images in Figure 2 below. You should be able to recognise the former president George W Bush and the former secretary of state John Kerry. Back when the study was done, Kerry was the Democratic candidate running against Bush for the US presidency. Can you see some similarities between images A (Figure 1) and C (Figure 2), and between images B (Figure 1) and D (Figure 2)? The teaser is that the images in Figure 1 show what makes the faces of Bush and Kerry distinctive. 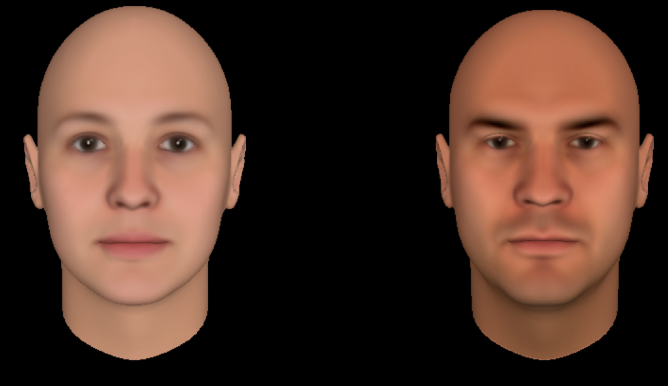 To obtain the distinctiveness of a face, you need only find out what makes it different from an average face – in this case, a morph of about 30 male faces. 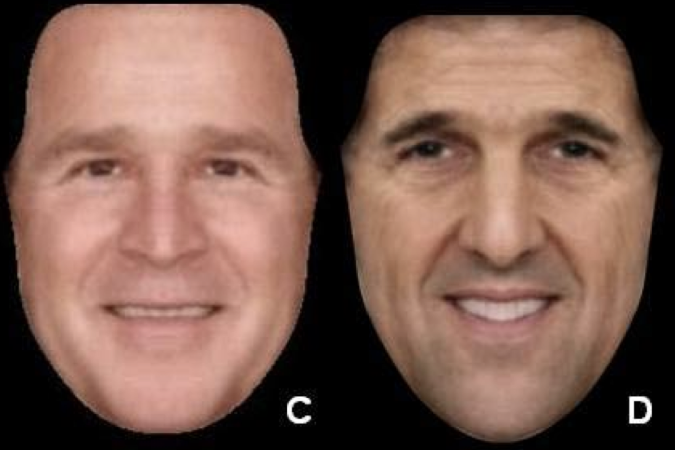 The faces in Figure 1 were created by accentuating the differences between the shapes of Bush’s and Kerry’s faces and the average face shape. At the time of the election in 2004, the US was at war with Iraq. I will leave the rest to your imagination. What we consider an important characteristic also depends on our ideological inclinations. Take a look at Figure 3 below. Who would make a better leader? ...whereas liberal voters tend to choose the face on the left, conservative voters tend to choose the face on the right. These preferences reflect our ideological stereotypes of Right-wing, masculine, dominant-looking leaders, and Left-wing, feminine, non-dominant-looking leaders. Figure - (click to enlarge). 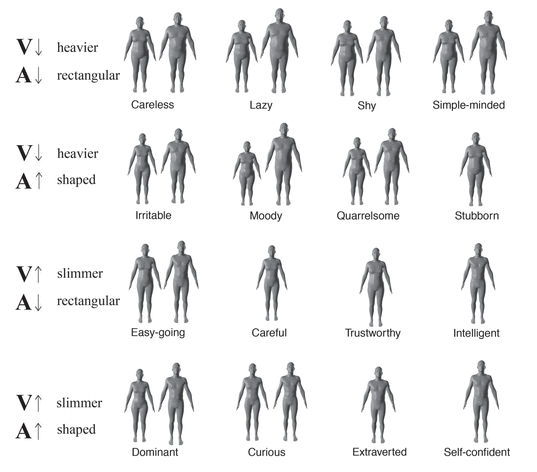 A subset of body stereotypes we created from single or multiple bodies that received extreme ratings on individual traits (for the entire set. The figure is organized to show sample traits with positive and negative combinations of valence (V) and agency (A). For example, Row 1 shows bodies that have negative valence (heavier) and negative agency (less shaped, more rectangular). Successes of advantaged group members get more attention. Inequality prospers when successes of advantaged group members (e.g., men, whites) get more attention than equivalent successes of disadvantaged group members (e.g., women, blacks). What determines whose successes individuals deem worth promoting vs. those they ignore? Using hundreds of thousands of tweets from the 2016 Olympics, we show that liberals are much more likely than conservatives to shine a spotlight on black and female (vs. white and male) US gold medalists. Two further experiments provide evidence that such differential amplification of successful targets is driven by a motivation—higher among liberals—to raise disadvantaged groups’ standing in service of equality. We find that liberals drive differential amplification more than conservatives and establish a behavioral mechanism through which liberals’ egalitarian motives manifest. Cooperrider proceeds to describe numerous examples of cognitive diversity that are disappearing, differences in how we relate to space, time, numbers, nature, each other, how we filter our experiences and allocate our attention.